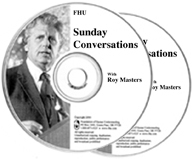 Roy Masters, whose business is helping people overcome stress, uses his final Sunday Conversation of 2015 to take an accounting of where we are, and how to prepare ourselves for what lies ahead in 2016. As always, Roy deals with straight truths and simple solutions. The truths may be disturbing to you, but the solution may be what you have been looking for. For example, if you’re caught up in addictions and obligations, Roy gives you a simple tool for finding your way back. Visit www.AntidoteForAll.com for the complimentary technique. Whether the subject is our culture, being politically correct, or marriage, you’ll not find anyone else who speaks quite like this. For more about Roy Masters and the beginnings of the Foundation of Human Understanding, Roy suggests you visit here for an excerpt from the book, "Healers, Gurus and Spiritual Guides". The complimentary video, “Roy Masters Hypnosis Demonstration,” that Roy refers to can be found here.